Brainstorming is a situation where a group of people meets to generate new ideas and solutions around a specific domain of interest by removing inhibitions. 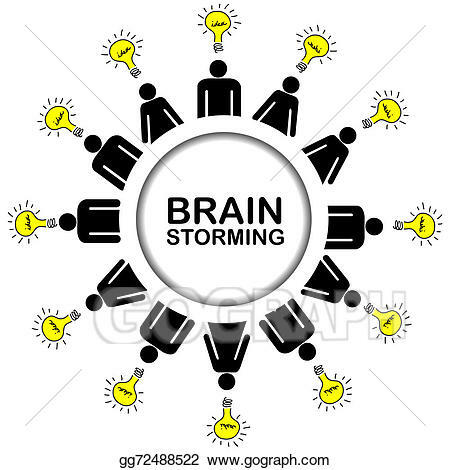 13 Oct Discover 7 steps to conduct Brainstorming effectively. People are able to think more freely and they suggest many spontaneous new ideas as possible. All the ideas are noted down and are not criticized and after brainstorming session the ideas are evaluated. How to make Brainstorming more effective? There are no titles only brains: Always try to leave your titles outside the room while participating in a brainstorming session. If you want unbiased opinions and views of the participants, drop or leave your designation outside. 3. Try to get unbiased, fresh perspective to a problem: that the core objective of any brainstorming session. Fill the room with people who are not from your trade or line of business. You shall get fresh point of views and perspectives to solve your core issues. 4. No pop-up quizzes: Set clear agenda prior to setting up the brainstorming session. You can offer the opt-out option in order to maintain the ideal participation. Give people the problem or issues prior to meeting. Remember, problems are solved by sub-conscious mind. 5. Set the mood of the brainstorming session: Find some creative exercise or teamwork, bring-in an element of fun in the session. 6. Appreciate the person and the given Idea: Remember every idea is workable, so always give a big thumbs up when an idea is given and appreciate the person. 7. Always document or record the session so that you can re-live the moment wherein the spark of a great idea was born and use it to inspire the other team members. When managed well, brainstorming can help you generate radical solutions to problems. It can also encourage people to commit to solutions because they have provided input and played a role in developing them. Ritesh Mohan is a passionate retail professional with over 19 years in the retail sector, handling some of the biggest brands in beauty, fashion and fragrances retail & FMCG sector. He has been instrumental in the growth of some of the regional brands as well in the Middle East region. He specializes in Retail management, Product development, Brand management, Retail Operations, Sales Management, Business Management & Empowering business owners with his wisdom & experience of around two decades in the industry.